Freesat Digital TV provided by BBC and ITV and installed by your local TV Services engineer. How much does Freesat cost? What Freesat packages do you provide? Do I need a licence for Freesat? Does Freesat have saorview? What channels do I get with Freesat? How can I get Freesat? How does Freesat differ from Free to Air Why TV Services? How much does Freesat cost? Do I need a licence for Freesat ? What channels do I get with Freesat ? For a full list of channels available on Freesat, click here to download PDF. How does Freesat differ from Free to Air? Free to air boxes are programmed to receive all available TV and radio channels whether scrambled on unscrambled from the satellite. The channels received have to be edited in to an order for viewing and there is no EPG (Electronic Programme Guide) available. Updates are not automatic and occasionally receivers will have to be retuned. What Freesat packages do you provide? There are 3 varieties of Freesat that we can install. To help you make the most of what you want to watch on your TV, the new Freesat system will have a built in TV programming guide, providing you with up to date TV listings seven days in advance of when your favorite digital television shows are on. There will also be digital subtitles and audio description available. Freesat HD (High Definition) provides up to 5 times greater digital picture quality than standard definition, with much finer detail and more vibrant colours. You will also benefit from improved audio, with some programme’s being available in Dolby Digital Surround Sound. If you have a HD compatible television, and a HD Freesat receiver, you will benefit from the Freesat channel line up in glorious High Definition, providing greater, sharper and much more vibrant colours and detailed pictures. The new Freesat+ digital satellite television receiver has all the glorious and exciting features such as HD programming and the fantastic ability to pause, rewind and fast forward live TV! Provided with an integrated hard drive, the Freesat+ receiver will also allow you to record your favorite television shows, and providing you have a second satellite cable feed from your satellite dish, you will also be able to record one television channel whilst watching another! Freesat+ also reduces the need for recordable tapes or DVD discs, because all your favourite programmes are stored directly onto the built in Freesat hard drive! No, Saorview is Ireland’s National Digital Service whereas Freesat is the UK National Digital Service. They are two independent digital providers. However, TV Services can supply and install an aerial which will enable you to receive the Saorview service. How can I get Freesat ? Don't forget, Freesat has no monthly charges, subscription or minimum contract. 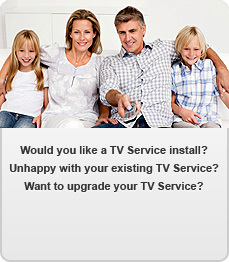 You pay ONLY for the equipment and installation, both of which, TV Services can provide. All TV Services Freesat Installers Have A Minimum of 5 Years Experience. Local Freesat Installers, With In-depth Knowledge of Your Area. Quality Materials & Tools To Ensure The BEST Freesat Installations.